As in The Gin Shop, the series is not simply about the evils of drink. (For what it is worth, one may note that Cruikshank became a teetotaller after The Bottle was published.) It is a companion piece, by antithesis, to the literature of working-class endeavor also closely linked to teetotalism such periodicals as John Cassell's The Working Man's Friend (1850-53). Drink was evil because it threatened the economic ethic of self-help, with its ancillaries of self-respect and the ordered family unit. Cruikshank, who argues that alcohol consumption quickly leads to addiction, which in turn leads to the misery of poverty and unemployment, here differs from Charles Dickens. The novelist does not ascribe "poverty, misery, wretchedness, insanity, and crime" (conditions that Cruikshank identified in the preface to the second, "cheap" edition) exclusively to the consumption of "intoxicating liquors" (cited by Vogler, p. 159). 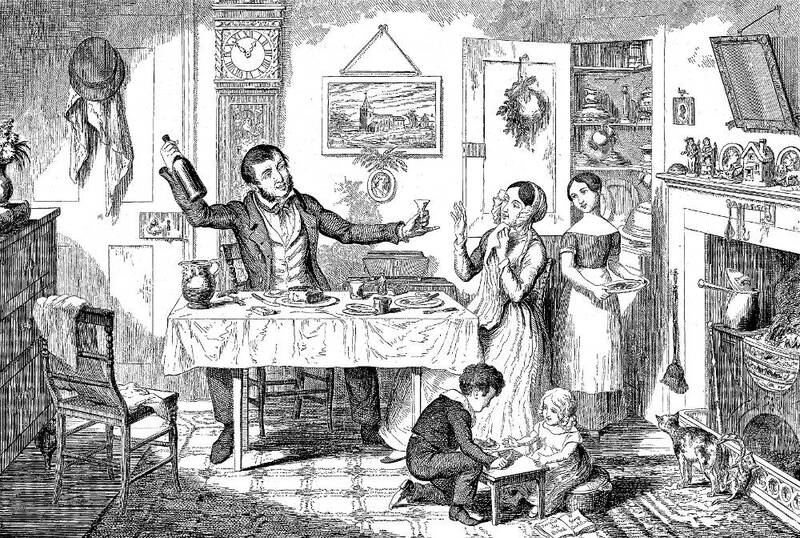 Dickens thought the oppoisite — namely, that alcoholism, as Cruikshank depicted it in "The Gin Shop" in Sketches by Boz and the figures of Nancy and Sikes in Oliver Twist, stems from poverty and hopelessness rather than the other way round. He commented to his intimate friend and business advisor John Forster that "the drinking should have begun in sorrow, or poverty, or ignorance" (quoted in James, p. 165). Dickens therefore did not regard "universal total abstinence" as the speedy solution to society's ills. Inspired in part by Cruikshank's own drinking, both narrative-pictorial series of the late 1840s established Cruikshank as a kind of "Modern Hogarth." However, as opposed to the narrative development of the theatrical scenes of The Rake's Progress and The Harlot's Progress, in the contrasting scenes of idleness and industry in Gin Lane (1751) and Beer Street, Hogarth falls back on the strategy of depicting stark differences, of debauchery and dissipation versus moderation and civic order; moreover, he does not preach — he merely describes the radically different London street scenes in vivid detail, and lets the viewer arrive at his or her own conclusions about the perils of gin, and the benefits of beer in modest proportions. As Richard A. Vogler points out, “Although Cruikshank's prints do not involve as much detail as Hogarth's, they certainly do offer a more complicated visual narrative than meets the eye at first glance. Of particular interest in the first three designs of this series is the symbolic use of setting and ornamentation to convey the theme of ‘home sweet home’” (p. 160). the design of the series owes much to the theatrical "box set" introduced into England a few years previously (1841) by Madame Vestris. In all but one of the scenes the setting remains the same, the cleverest effect of all coming in the final act, where the mad cell is shown to have exactly the same lay-out as the sitting-room in which the story opened, but denuded of all human meaning. . . . Within this set framework Cruikshank was able to chronicle minutely the degradation of the group, physically and symbolically. . . . The clock indicates that the mid-day meal has just concluded, and the partially-cut cake on the table accords with the time on the clock, 12:53 P. M. Among the details suggestive of respectability and lower-middle-class propriety are the Bible, the picture of the church, china figurines on the mantel, and miniatures of the royal couple, renowned as model parents. The idealized cottage on the mantel, the miniatures, and statuettes are analogues for the happy family; over the course of the eight illustrations these symbolic objects gradually disappear, beginning with the figure of the man at the left, which appears to have been knocked over in the second frame. The kitten in front of the coal fire plays harmlessly with its mother's tail. The two younger children have presumably just eaten lunch at their own table, and their older sister is now putting the dishes away (a detail that suggests that the family does not employ a servant, and is therefore not quite of the class of Charles Dickens's parents, for example). The elegant furnishings, the tidy bric-a-brac, the carpet, the roaring coal-fire, the open china cupboard, and the well-clothed family at their ease constitute a lower-middle-class paradise that the serpent, the black gin bottle, has already penetrated. As Martin Meisel and Vogler note, the popular folio series was the subject of both a poem of volume length, a penny novel by Gabriel Alexander (1848), a sonnet by Matthew Arnold, and eight dramatic adaptations, "temperance melodramas," which people not unlike Cruikshank's characters watched at London's minor theatres. Journalist and playwright Douglas Jerrold in his review of Cruikshank's initial folio collection in Douglas Jerrold's Weekly Paper (11 September 1847) predicted that the eight highly dramatic illustrations would lend themselves to immediate stage adaptation; indeed, he described Cruikshank's modern "progress" as "a perfect domestic drama in eight acts": "There is, so to speak, excellent dramatic conduct in this tragedy of The Bottle . . . and event follows event in natural order, leading as surely to the tragic end, as the fable of a Greek tragedy" (cited in Meisel, p. 124). It was, as he predicted, "speedily placed upon the stage" — of eight different theatres, in fact. The foremost of these London plays derived from Cruikshank's best-selling narrative-pictorial sequence was Tom Taylor's melodrama in two acts, "Founded Upon the Graphic Illustrations of George Cruikshank," first staged at The City of London Theatre, but soon popular on both sides of the Atlantic. Although it lacks what Roberson Davies terms Cruikshank's "incisiveness and stimulating grotesquerie" (237), the success of Taylor's adaptation had much to do with the adaptor's carefully modelling the production's sets and situations (from One: the Happy Home through Eight: the Madhouse) on the original illustrations. Cruikshank's sensational folio, reasonably priced for middle-class consumption, was a mid-Victorian publishing and cultural phenomenon. Davies, Robertson. "Playwrights and Plays, 1840-1850." The Revels History of Drama in English, Volume VI: 1750-1880. Ed. Clifford Leech and T. W. Craik. London: Methuen, 1975. Pp. 231-240. James, Louis. "An Artist in Time: George Cruikshank in Three Eras." George Cruikshank: A Revaluation. Ed. Robert L. Patten. Princeton: Princeton U. P., 1974, rev., 1992. Pp. 156-187. McLean, Ruari. George Cruikshank: His Life and Work as a Book Illustrator. English Masters of Black-and-White. London: Art and Technics, 1948. Meisel, Martin. Realizations: Narrative, Pictorial, and Theatrical Arts in Nineteenth-Century England. Princeton: Princeton U. P., 1989.